Featuring a Fireplace, TV and Wifi, Chalet 204 offers comfortable holiday rental accommodation in Les Deux Alpes on various board options including Catered, Bed & breakfast and Half board. Chalet 204 is a 3 bedroom chalet that can comfortably accommodate 8 people. Conveniently located near to the pistes of the French resort of Les Deux Alpes. Chalets du Soleil has 1 bedroom and can accommodate upto 5 people on a Room only basis. Au coeur des Ours is a 2 bedroom apartment that can comfortably accommodate 6 people. Conveniently located near to the pistes of the French resort of Les Deux Alpes it is available on a Self catering basis. The property also features a TV and Wifi. Arc en Ciel is a 1 bedroom apartment that can comfortably accommodate 4 people. Located in the French resort of Les Deux Alpes it is available on a Self catering basis. Le Prapelier is a 1 bedroom apartment that can comfortably accommodate 4 people. Located in the French resort of Les Deux Alpes it is available on a Self catering basis. Conveniently located near to the pistes of the French resort of Les Deux Alpes. La Grande Chaume has 1 bedroom and can accommodate upto 4 people on a Room only basis. A 1-bedroom apartment which can sleep 4, situated in the resort of Les Deux Alpes in France. Available for holiday rent on a Self catering basis. A 1-bedroom ski apartment which can sleep 4, situated in the ski resort of Les Deux Alpes in France. Residence Les 2 Alpes has a Pool, Hot tub and TV, and is available for holiday rent on various board options including Self catering and Half board. Residence Vallee Blanche is a 1 bedroom ski-in ski-out apartment that can comfortably accommodate 4 people. Located in the French ski resort of Les Deux Alpes it is available on various board options including Self catering, Bed & breakfast and Half board. Located in the French ski resort of Les Deux Alpes. Residence Le Goleon has 5 bedrooms and can accommodate upto 10 people on various board options including Self catering and Half board. This ski apartment also features a Pool and TV. Located in the French ski resort of Les Deux Alpes. Residence Le Jandri has 1 bedroom and can accommodate upto 4 people on various board options including Self catering and Half board. This ski-in ski-out apartment also features a Pool, Hot tub and TV. A 1-bedroom ski apartment which can sleep 4, situated in the ski resort of Les Deux Alpes in France. Available for holiday rent on various board options including Self catering and Half board. Chalet Prestige Lodge is located in the French ski resort of Les Deux Alpes. This ski apartment has 2 bedrooms and can accommodate upto 14 people on various board options including Self catering and Half board. The property also features a Pool, Sauna, Fireplace and TV. Located in the French ski resort of Les Deux Alpes. Residence Meijotel has 2 bedrooms and can accommodate upto 8 people on various board options including Self catering and Half board. Located in the French ski resort of Les Deux Alpes. Chalet Levanna Occidentale has 4 bedrooms and can accommodate upto 14 people on various board options including Self catering and Half board. This ski apartment also features a Pool, Fireplace and TV. Chalet Le Marmotton is located in the French ski resort of Les Deux Alpes. This ski apartment has 2 bedrooms and can accommodate upto 8 people on various board options including Self catering and Half board. The property also features a Pool, Fireplace and TV. Offering holiday accommodation in Les Deux Alpes on various board options including Self catering and Half board, Residence St. Christophe is a 1 bedroom ski apartment that can comfortably accommodate 6 people. Residence Le Surf des Neiges is a 2 bedroom ski apartment that can comfortably accommodate 7 people. Located in the French ski resort of Les Deux Alpes it is available on a Self catering basis. The property also features a Pool and TV. A 1-bedroom ski apartment which can sleep 6, situated in the ski resort of Les Deux Alpes in France. Available for holiday rent on various board options including Self catering and Half board. Offering holiday accommodation in Les Deux Alpes on various board options including Self catering and Half board, Chalet Les Jonquilles is a 6 bedroom ski apartment that can comfortably accommodate 12 people. The property also features a Pool, Fireplace and TV. A 2-bedroom ski apartment which can sleep 10, situated in the ski resort of Les Deux Alpes in France. Residence LOurs Blanc has a Pool and TV, and is available for holiday rent on various board options including Self catering and Half board. This 5 bedroom ski apartment is located in the French resort of Les Deux Alpes. Available on various board options including Self catering and Half board, Chalet Soleil dHiver can sleep upto 12 people. This ski apartment also features a Pool, Hot tub and TV. 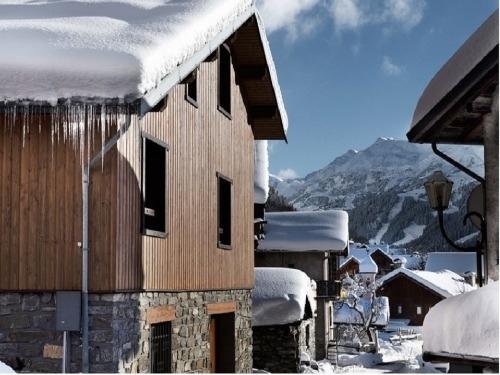 Chalet La Muzelle is a 4 bedroom ski apartment that can comfortably accommodate 18 people. Located in the French ski resort of Les Deux Alpes it is available on various board options including Self catering and Half board. The property also features a Pool, Fireplace and TV. Located in the French ski resort of Les Deux Alpes. Residence Alpina Lodge has 4 bedrooms and can accommodate upto 10 people on various board options including Self catering and Half board. A 2-bedroom ski apartment which can sleep 8, situated in the ski resort of Les Deux Alpes in France. Residence Edelweiss has a Pool and TV, and is available for holiday rent on a Self catering basis. This 2 bedroom ski apartment is located in the French resort of Les Deux Alpes. Available on various board options including Self catering and Half board, Residence Val Ecrin can sleep upto 8 people. Chalet Harmonie is a 2 bedroom ski apartment that can comfortably accommodate 12 people. Conveniently located near to the pistes of the French ski resort of Les Deux Alpes it is available on various board options including Self catering and Half board. The property also features a Pool, Fireplace and TV. This 2 bedroom ski apartment is located in the French resort of Les Deux Alpes. Available on various board options including Self catering and Half board, Residence Au Coeur des Ours can sleep upto 8 people. This ski apartment also features a Pool and TV. Chalet Soleil Levant is a 6 bedroom ski apartment that can comfortably accommodate 12 people. Located in the French ski resort of Les Deux Alpes it is available on various board options including Self catering and Half board. The property also features a Pool, Sauna and TV. A 4-bedroom ski apartment which can sleep 16, situated in the ski resort of Les Deux Alpes in France. Chalet Alpina has a Pool, Sauna, Hot tub, Fireplace and TV, and is available for holiday rent on various board options including Self catering and Half board. This 4 bedroom ski apartment is located in the French resort of Les Deux Alpes. Available on various board options including Self catering and Half board, Residence Le Cortina can sleep upto 10 people. This ski apartment also features a Pool and Hot tub. Offering holiday accommodation in Les Deux Alpes on various board options including Self catering and Half board, Residence Plein Sud is a 1 bedroom ski apartment that can comfortably accommodate 6 people. A ski hotel with rooms that can sleep 3, situated in the ski resort of Les Deux Alpes in France. Hotel Le Pied Moutet has a Sauna and TV, and is available for holiday rent on a Half board basis. Offering holiday accommodation in Les Deux Alpes on various board options including Self catering and Half board, Residence Cote Brune is a 1 bedroom ski apartment that can comfortably accommodate 6 people. A 4-bedroom ski apartment which can sleep 12, situated in the ski resort of Les Deux Alpes in France. Chalet Leslie Alpen has a Pool, Hot tub, Fireplace and TV, and is available for holiday rent on various board options including Self catering and Half board. Featuring a Pool, Fireplace and TV, Chalet Erika offers comfortable holiday rental accommodation in Les Deux Alpes on various board options including Self catering and Half board. Chalet Erika is a 4 bedroom ski apartment that can comfortably accommodate 16 people. Chalet Levanna Orientale is a 4 bedroom ski apartment that can comfortably accommodate 12 people. Located in the French ski resort of Les Deux Alpes it is available on various board options including Self catering and Half board. The property also features a Pool, Fireplace and TV. A 5-bedroom ski apartment which can sleep 12, situated in the ski resort of Les Deux Alpes in France. Chalet Le Ponton has a Pool, Sauna, Fireplace, TV and Wifi, and is available for holiday rent on various board options including Self catering and Half board. Offering holiday accommodation in Les Deux Alpes on various board options including Self catering and Half board, Residence Alba is a 4 bedroom ski apartment that can comfortably accommodate 10 people. Residence Le Flocon dOr is located in the French ski resort of Les Deux Alpes. This ski apartment has 1 bedroom and can accommodate upto 6 people on a Self catering basis. The property also features a Pool and TV. This 1 bedroom ski apartment is located in the French resort of Les Deux Alpes. Available on various board options including Self catering and Half board, Residence Andromede can sleep upto 4 people. Located in the French ski resort of Les Deux Alpes. Chalet Les Alpages has 2 bedrooms and can accommodate upto 8 people on various board options including Self catering and Half board. This ski apartment also features a Pool, Fireplace and TV. Residence LOurs Blanc is located in the French ski resort of Les Deux Alpes. This ski apartment has 2 bedrooms and can accommodate upto 10 people on various board options including Self catering and Half board. The property also features a Pool and TV. Located in the French ski resort of Les Deux Alpes. Chalet De Marie has 4 bedrooms and can accommodate upto 12 people on various board options including Self catering and Half board. This ski apartment also features a Pool, Sauna, Hot tub, Fireplace and TV. Located in the French ski resort of Les Deux Alpes. Chalet Husky has 3 bedrooms and can accommodate upto 12 people on various board options including Self catering and Half board. This ski apartment also features a Pool, Fireplace and TV.